Prince William has answered criticism of his commitment to royal duties, saying he is willing to take on more responsibility when the time comes. He was speaking in a BBC interview in which he paid tribute to the Queen on the eve of her 90th birthday. She had been a "guiding example" of what a good monarch should be, he said. Meanwhile, a picture of the Queen, the Prince of Wales, Prince William and Prince George, for stamps to mark the monarch's birthday, has been released. The Queen, accompanied by the Duke of Edinburgh, met staff and viewed an exhibition at Windsor's Royal Mail delivery office in the first of a series of events to mark her birthday on Thursday. Her visit marked the 500th anniversary of the postal service and she was welcomed with singing from the Royal Mail choir. The royals then headed to Alexandra Gardens in the town for a ceremony to officially open a new bandstand and met pupils from the six schools involved in its decoration. The children also sang Happy Birthday. Prime Minister David Cameron and Labour leader Jeremy Corbyn were among the political leaders who said they were looking forward to wishing the Queen a happy birthday, at Prime Minister's Questions. Mr Cameron said Thursday was an "important landmark", adding the monarch had served the nation with "dignity". In an interview with BBC royal correspondent Nicholas Witchell, Prince William said: "The Queen's duty and her service, her tolerance, her commitment to others - I think that's all been incredibly important to me and it's been a real guiding example of just what a good monarch could be." The prince's own commitment to royal duty has been questioned in recent months, with headlines in some newspapers referring to him as "work-shy William". He said he did not ignore such criticisms but did not take them completely to heart. Media captionPrince William: "When the Queen decides that she's going to hand down more responsibilities, I'll be the first person to accept them"
"I take duty very seriously. I take my responsibilities very seriously. But it's about finding your own way at the right time and if you're not careful duty can sort of weigh you down an awful lot at a very early age and I think you've got to develop into the duty role," he said. He said both his father and grandmother fully supported the fact that he was not yet fully engaged with royal duties, but when the time came to accept more responsibility he would do so. The recent headlines about William being a "work shy" prince signalled a change in the relationship between the prince and a press pack who, up until now, have rarely criticised him. In the BBC's interview, it was interesting to see his response. He accepts that he will be criticised "but it's not something I take completely to heart". An indication that negative headlines are likely to be par for the course in his role as a future heir but won't necessarily influence his decisions. It was clear that his priority remains trying to live as normal a life as possible for as long as possible, both for the sake of his wife and children but also himself. There was also a rare insight into what kind of monarch he plans to be. When asked about the different approach to public life taken by his father as opposed to the Queen his response was that the latter was "the best role model I could have in front of me". Queen's 90th: What's happening and when? Ten stamps have been released to celebrate the Queen's birthday, including a stamp sheet featuring four generations of the Royal Family. 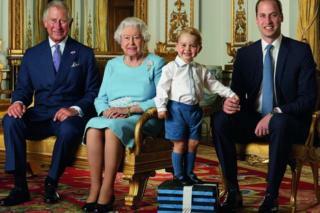 The picture of the Queen, Prince Charles, Prince William and Prince George was taken at Buckingham Palace last year. Six further stamps have been released for the head of state's 90th birthday, three focusing on the Queen's family life and three honouring her official role. Media captionWhat do you think of the Queen's 90th birthday portrait? Would you dress your son this way? On her actual birthday, on Thursday, the Queen and Prince Philip will walk around Windsor and unveil a plaque marking The Queen's Walkway, a 6.3km self-guided walking trail connecting 63 points of significance. It was designed to recognise the moment the monarch broke the record on 9 September 2015 held by her great-great-grandmother Queen Victoria by being on the throne for 63 years and seven months. In the evening, she will light a beacon setting in train a series of more than 900 beacons across the UK and around the world to mark the milestone birthday. On Friday, US President Barack Obama and First Lady Michelle Obama will join the Queen for lunch at Windsor Castle. Britain's longest-serving monarch celebrates two birthdays each year, her actual birthday on 21 April and her official birthday on a Saturday in June. Republic said the Queen's birthday "does not warrant this kind of coverage" and that the BBC had a "duty to report, not to celebrate the royals". Graham Smith, the republican pressure group's CEO, added that the BBC had "failed completely" to report the birthday in a way that was "fair, balanced and proportionate".